The British Museum plans to reorganize its collections and displays over the next ten years and the famous Round Reading Room will feature in its plans. What will become of it we wonder. 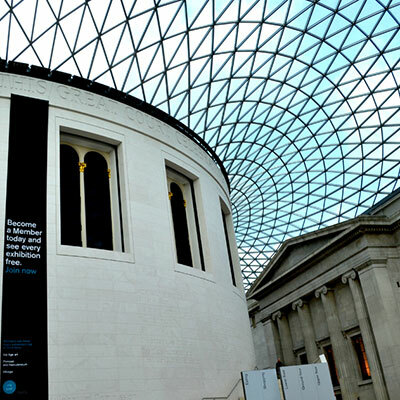 The British Museum plans to reorganize its collections and displays over the next ten years. Visitors to Britain’s number one visitor attraction can expect a gradual evolution of the museum’s gallery spaces, providing “more compelling and coherent stories”, according to museum managers. Perhaps that means they’ll unite the monumental Egyptian statues – now on the ground floor – with the mummies and ancient artifacts that are now several floors and a maze of corridors and galleries away. I’m glad to hear that the overhaul will include some serious attention to the Round Reading Room and its role in the grand scheme of things. The 19th century, Grade I listed room, with its beautiful blue, cream and gold dome and its halo of 20 arched windows, holds a special place for me and many other writers. I spent the better part of one intense and memorable summer studying there. I’d been accepted, as a mature student, onto a famous, competitive Masters degree program. It had been decades since I’d last been in a classroom and the reading list that accompanied the offer might as well have been in Chinese for all the sense I could make of it. Writers I had barely heard of, subjects of which I’d only the slightest awareness, esoteric literary criticism, advanced semiotic studies. And to make matters worse, almost all the books and articles were long out of print. The only place to find them was the British Library. You can’t borrow books or journals from the British Library. You have to apply for a reader’s pass, then go there and read. I have to admit, I felt very special on the day I got my pass. The British Library is not a public library in the usual sense. Members of the general public can only get a reader’s pass if they need something that is not available anywhere else. But, as a graduate student I was entitled to a pass for unlimited use of the Library for a year. 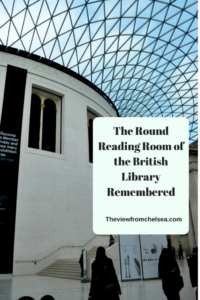 Clutching my pass, I headed for the British Museum where the British Library reading room was then located – in the freestanding, drum-shaped building that now occupies the centre of the museum’s Great Court. Some books were kept there but most were in storage facilities all over London and the southeast of England. Books had to be ordered in advance and then took up to 48 hours to be delivered to the reading room. Entering the Round Reading Room for the first time was an intimidating experience. The dome, 140 feet in diameter and just slightly smaller than the Pantheon in Rome, hung over a whispering silence, teeming with literary spirits. The only sounds that intruded were the occasional scrape of a chair, a muffled footstep, a hint of conversation at the central desk or the hiss of pencil on paper (pens were not allowed in the Round Reading Room). Around the walls, 25 miles of bookshelves contained thousands of reference books – most other books were miles away. Five hundred desks, arranged like spokes of a bicycle wheel, filled the space below the massive dome. Each desk had its own light, its own number and its own sound reducing blotter. The dome…hung over a whispering silence, teeming with literary spirits. Several full, 20-volume sets of the Oxford English Dictionary, with lecterns on which to read the huge individual books anchored the ends of some of the spokes. It may seem hard to believe but it wasn’t really that long ago when scholars had to look everything up in books. Given the inscrutable language of the academic texts I struggled through that summer, I spent a lot of time at those lecterns. I also spent a lot of time, exploring the British Museum’s main floor galleries in virtual isolation. You see, the Library was open later than the Museum (on late nights by as much as four hours later) and the only way into the Round Reading Room was through the Museum. So some of the galleries were always accessible. I became a regular, visiting two or three times a week and staying as late as I could. On any given night, while waiting for books (helpers still deliver the books you order from storage and stacks right to your desk), or when needing a bit of a wake up stretch and coffee in the Museum café (which kept the same hours as the Library) I might visit the Rosetta Stone, or gaze up at the monumental pink granite head of Amenhotep III. Along corridors 6 and 12, I lingered in the half lit galleries, studying cases full of Greek, Minoan, Mesopotamian and Phoenician jewelry and hair ornaments, (some of which made its way into my own book), game pieces, tiny gold or bronze boxes and urns for ancient ointments and salves. Sometimes a museum night guard would shadow me through the galleries at a distance; sometimes a couple of other scholars would pass on the way to café. But often I had the space all to myself. Then it was back to work in the Library, honoured to use it in the company of distinguished ghosts – Virginia Woolf, Oscar Wilde, Sir Arthur Conan Doyle, H.G.Wells, George Orwell, Arthur Rimbaud, George Bernard Shaw, Bram Stoker, Charles Dickens, Rudyard Kipling, Mahatma Gandhi and, yes, Lenin and Karl Marx, who spent 40 years writing Das Kapital in this very room. 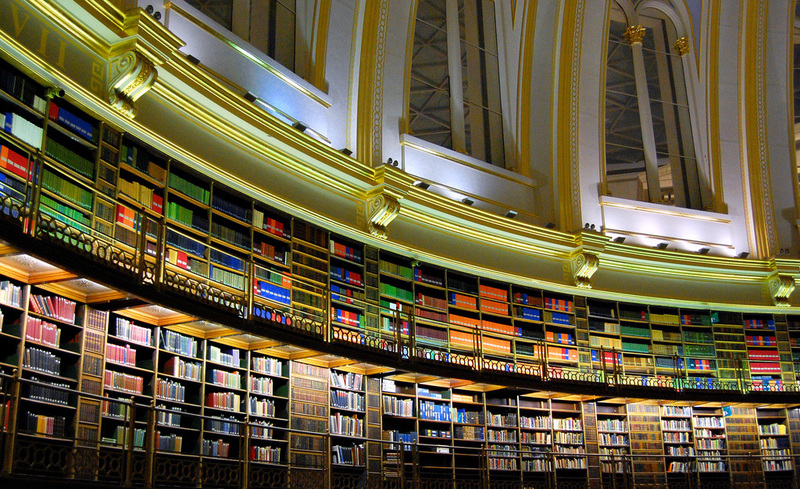 When the new British Library opened in St. Pancras in 1997, the Round Reading Room lost its purpose and it has been locked behind closed doors, with the exception of a few special exhibitions, ever since. I hope it will be more than just a pretty face. The Great Court of the British Museum. ©Ferne Arfin. The round drum in the centre of the Great Court conceals the Round Reading Room. The double arched windows are the giveaway. The British Museum, on Great Russell Street, London WC1B 3DG, is open every day except December 24 through 26, New Year’s Day and Good Friday. Hours are 10 a.m. to 5:30 p.m., and Fridays to 8:30 p.m. Admission, except for special exhibitions, is free. 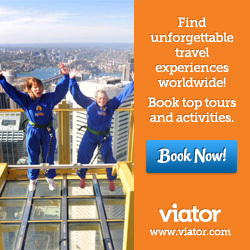 Nearest London Underground stations are Tottenham Court Road, Russell Square or Holborn. The New British Library in St Pancras, 96 Euston Road, London NW1 2DB, has several public galleries where permanent and changing displays of the library’s treasures are exhibited for free. These range from the original copy of the Magna Carta to handwritten lyrics by the Beatles. There are also special exhibitions that may be ticketed. In 2018/19, the Domesday Book, on loan from the National Archives, will be part of the Anglo Saxon Kingdoms Exhibition (from October 19, 2018 to February 19, 2019). Tickets are available online. The exhibition is open during normal library opening hours. Very interesting and evocative. I never went there. Now I rather wish I had.